These are large files due to the multiple pages which take a few seconds to download but it’s worth the wait ! 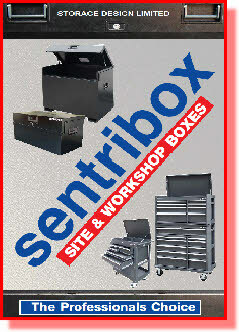 The Sentri range of Black Site and Vehicle boxes has built up a considerable reputation over the last 13 years from a standing start to being a leading, respected,trusted and recognised brand throughout the industry at home and around the world. As leading designers of metal storage systems we have now taken box engineering to new levels and the locking system is now so far advanced for site and vanboxes that we have patents and design copyrights pending worldwide. 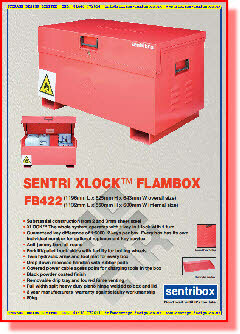 The Xlock™ system of two 8mm thick deadlocks working in the horizontal plane and two 8mm thick hooklocks working in opposing directions in the vertical plane mean you have a 4 point locking system on every Sentri XLOCK™ box that is not equalled on any sitebox available in the world today.  Complete with nyloc nuts and bolts. Following the successful addition of the workshop boxes to our Sentribox range last year we have continued to move on and improve the quality, finish and packaging of the professional range. 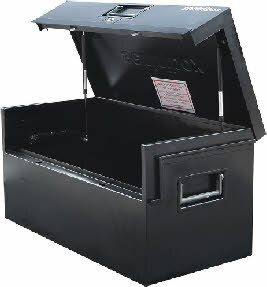 We have added an all new professional X range which is designed for even the most discerning engineers and tradesmen.All Sentri Workshop boxes have ball bearing slides and come in a black textured finish so not only do they perform superbly but look ultra professional as well. 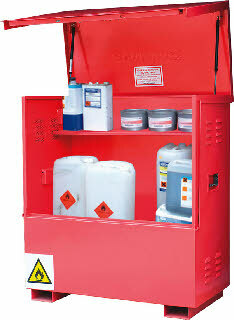 Indeed a box you can be proud of.There are many workshop boxes in the market today but we have so much confidence in the high quality and standards set by these new ranges that we are offering them all with our 3 year guarantee against faulty workmanship.